In the present day world, although the giraffe species still suffers from hunting and poachers, they have been useful in scientific experiments and discoveries. Their skin has been observed by scientists for astronaut suits. Why you might ask? Well, because astronauts are in danger of passing out if their blood rushes to their legs. They were hoping that with giraffes being the tallest mammal on earth that this would help come to a means to solve this problem. Sadly, after further research their skin was not of use. Giraffes continuously have a presence in modern societies in various art forms. They are depicted in paintings by many famous artists. For example, Salvador Dali drew the species with conflagrates manes in some of his surrealist pieces. He considered the giraffe to be a masculine symbol. 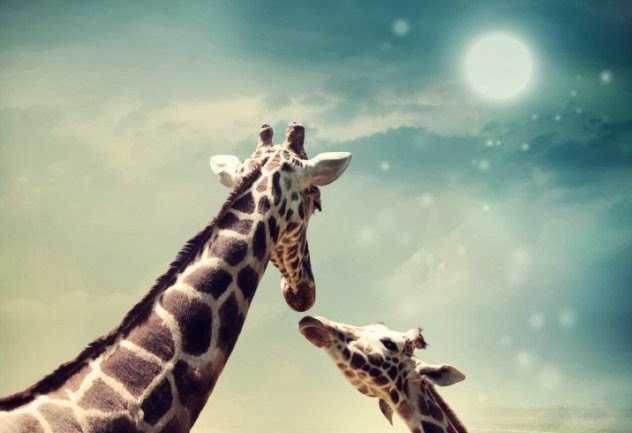 Giraffes are also featured in many children’s books such as Roal Dahl’s The Giraffe and the Pelly and Me. It has also been featured in many animated films such as The Lion King, Dumbo, and Madagascar. A giraffe is even a mascot for Toy “R” Us, Geoffrey the giraffe. Tanzania has even named the giraffe as its national animal. The giraffe species seems to be one of the more popular exhibits within zoos. They are in fact my personal favorite. They are magnificent creatures to observe up close and personal. They move with such grace despite their long legs and necks. They seem to captivate zoo visitors with their unusual characteristics. Throughout stories and art, I would classify girrafes as being viewed by society in two ways. In their cartoon movies and books they seem to be depicted as skiddish, fearful, clumsy animals. In paintings and fashion, they are depicted as beautiful, majestic creatures that one should marvel over. ﻿"Giraffe." A-Z-Animals.Com. A-Z Animals, 2008. Web. 06 Nov. 2013. <http://a-z-animals.com/animals/giraffe/>.